Governments generally make bad loan customers, as seizing territory is generally not possible for banks trying to collect unpaid loans. Governments, it turns out, do go bankrupt. Just ask Argentina’s creditors, or the European Central Bank on its Greek exposure. The Arab Gulf states have generally been creditors to other states, not borrowers; but that may soon start to change. In July, Saudi Arabia issued its first sovereign bond since 2007. On August 10, Bloomberg reported additional issues of an estimated $5.3 billion in bonds with five, seven, and 10 year maturities. The government is expected to raise as much as $27 billion in bond issues this year. Saudi Arabia and the other Arab Gulf states are certainly not nearing bankruptcy. They hold significant reserve assets and manage massive sovereign wealth funds. They are attractive to investors interested in buying sovereign bonds. Their economies are, however, highly sensitive to movements in U.S. interest rates, as all Gulf Cooperation Council states restrict their monetary policies in some way to the U.S. dollar. They are also, of course, sensitive to movements in the price of oil and gas. The third weakness in GCC economies is the shallowness of their financial and bank sectors. Banks are often caught in a cycle of boom or bust lending. As fiscal expansion in Arab Gulf states is tied to increases in oil revenue, states use these moments to spend on infrastructure and real estate projects, which then prompts related borrowing and growth. 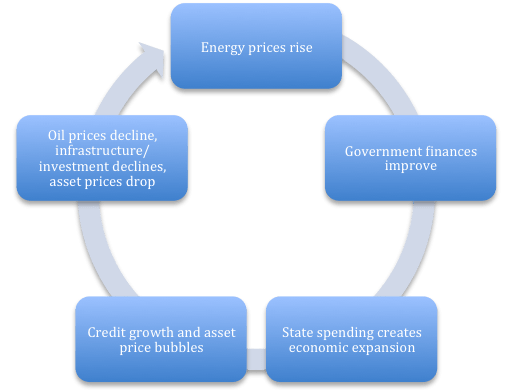 During periods of high energy prices, government finances improve, which creates domestic liquidity (government money goes into the domestic banking system), and investor and lender confidence rises. This translates to higher asset prices, often most visible in real estate. As financial institutions have an incentive to keep lending, they also increase their exposure to risk, again, especially in the construction and real estate sectors. Because other financial instruments (e.g., corporate bonds, derivative products) are less common in GCC markets, and investors (both private and state-related) prefer on a normative basis more tangible and sharia-compliant assets and opportunities, there are concentrated risks in the bank system. As the International Monetary Fund warned in October 2014, the composition of the labor force, particularly in the prevalence of nationals in the public sector, only worsens this cyclical weakness. In the GCC, the average share of nationals employed in the public sector is 60 percent (87 percent in Qatar). Oil revenue funds public sector wages, which also expands consumer spending and personal credit. These patterns increase bank exposure to oil revenue; they also make it difficult for governments to curb spending in salaries, subsidies, and expected bonuses when revenue changes. When energy prices fall sharply, the cycle reverses, putting pressure on banks to call in loans. On August 4, the IMF concluded its annual consultation with the United Arab Emirates and issued a veiled warning. There is a projected fiscal deficit for the first time since the global financial crisis in 2009, projected at 2.9 percent of gross domestic product. The IMF’s implicit warning is less about fiscal prudence and more about the composition of the UAE bank sector. Because the corporate landscape in the UAE (and in most of the other GCC states) is dominated by large government-related entities and family owned conglomerates, often with ties to ruling family members on their boards and as stakeholders, banks may not always comply with advice on loan concentration limits. In short, there is a risk of connected lending and banks underreporting non-performing loans. The persistent decline in oil prices will have some ripple effects in GCC economies. Qatar National Bank has forecast the current glut in oil markets to continue through 2016, with prices averaging around $55 per barrel until early 2017. GCC governments will have to engage fiscal policy on subsidies (everything from fuel to electricity to health care), public sector salaries, government-related entity debt and exposure, and planned investment and aid to regional allies, as well as their consistently increasing military expenditure. GCC governments will also need to consider how their models of state-led economic growth can weather a sustained period of oil price decline. This will involve more than “decoupling” from oil revenue through economic diversification (which is also important). It will mean creating wider debt markets domestically and regulatory systems that do not distinguish between borrowers. It will also mean that states seeking debt financing will have to disclose more information to creditors on fiscal balance sheets, and that could be a very positive shift in GCC public finance. While it will be difficult for GCC states to strictly enforce their existing bank regulations on non-performing loans and concentrated lending, there is some hope that by going to international capital markets to seek sovereign debt financing, transparency in fiscal policy will be improved.